Vatican City, 11 February 2013 (VIS) - Cardinal Angelo Sodano, dean of the College of Cardinals, on hearing the news of the Pope's resignation from the Petrine ministry, expressed his nearness, and that of all the cardinals, to Benedict XVI. "We have heard you," he said, "with a sense of loss and almost disbelief. In your words we see the great affection that you have always had for God's Holy Church, for this Church that you have loved so much. Now, let me say, on behalf of this apostolic cenacle? the College of Cardinals? on behalf of your beloved collaborators, allow me to say that we are closer than ever to you, as we have been during these almost eight luminous years of your pontificate. On 19 April 2005, if I remember correctly, at the end of the conclave I asked ? 'Do you accept your canonical election as Supreme Pontiff?' And you did not hesitate, although moved with emotion, to answer that you accepted, trusting in the Lord's grace and the maternal intercession of Mary, Mother of the Church. Like Mary on that day she gave her 'yes', and your luminous pontificate began, following in the wake of continuity, in that continuity with your 265 predecessors in the Chair of Peter, over two thousand years of history from the Apostle Peter, the humble Galilean fisherman, to the great popes of the last century from St. Pius X to Blessed John Paul II." "Holy Father, before 28 February, the day that, as you have said, you wish to place the word 'end' to your pontifical service, conducted with so much love and so humbly, before 28 February, we will be able to better express our feelings. So too will the many pastors and faithful throughout the world, so too all those of good will together with the authorities of many countries. ? Also, still this month, we will have the joy of listening to your voice as pastor: Ash Wednesday, Thursday with the clergy of Rome, in the Sunday Angelus, and the Wednesday general audiences, we will still have many occasions to hear your paternal voice. ? Your mission, however, will continue. You have said that you will always be near us with your witness and your prayer. Of course, the stars always continue to shine and so will the star of your pontificate always shine among us. 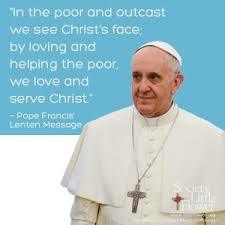 We are near to you, Holy Father, and we ask you to bless us."